Callable interface was added in Java 5 to complement existing Runnable interface, which is used to wrap a task and pass it to a Thread or thread pool for asynchronous execution. Callable actually represent an asynchronous computation, whose value is available via Future object. All the code which needs to be executed asynchronously goes into call() method. Callable is also a single abstract method type (SAM type), so it can be used along with lambda expression on Java 8. 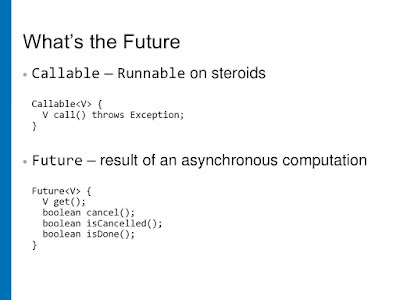 Both Callable and Future are parametric type and can be used to wrap classes like Integer, String or anything else. When you pass a Callable to thread pool, it choose one thread and execute the Callable. It immediately return a Future object which promises to hold result of computation once done. You can then call get() method of Future, which will return result of computation or block if Computation is not complete. If you don't like indefinite blocking then you can also use overloaded get() method with timeout. Future also allows you to cancel the task if its not started or interrupt if its started. We will see, how we can calculate factorial of large number using Callable and Future in Java. BTW, if you are serious about mastering concurrency API of Java, I suggest you to also take a look at one of the best book on the subject, Java Concurrency in Practice by Brian Goetz. It is one of the book I keep refer whenever I have a doubt or want to refresh my knowledge. Many of you would be familiar with Runnable interface, one of the most popular way to use thread in Java, but you would be happy to know that Runnable is not the only way to create a task which can be executed by parallel threads. You can also use Callable interface to do the same. 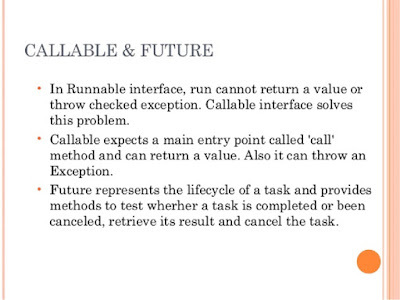 Main difference between Runnable and Callable is that Runnable cannot return any value back to caller but Callable can return value. 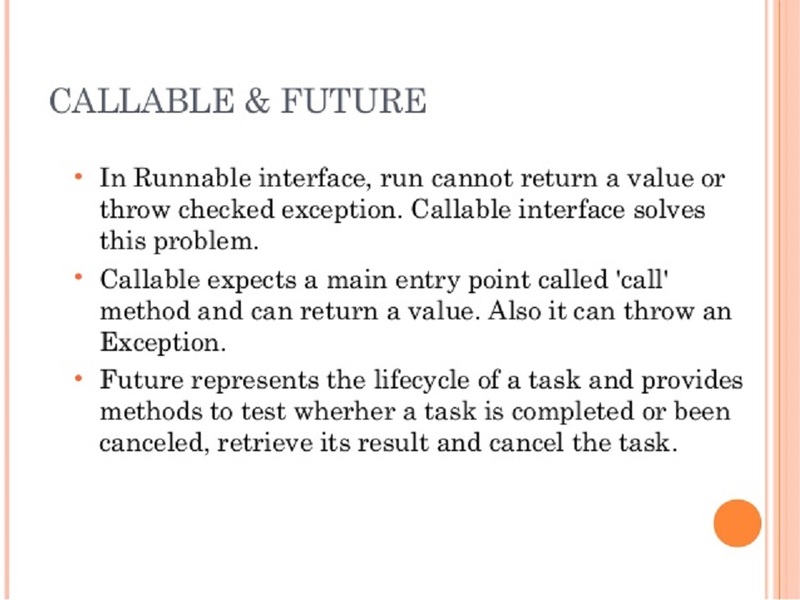 Another difference is that call() method from Callable can also throw checked exception which was not possible by run() method of Runnable interface. See here to learn more about difference between Runnable and Callable in Java. Here is our complete Java program to demonstrate how you can use Callable and Future together to implement asynchronous processing in Java. Once you started using thread pool, Callable and Future, you don't need to wait for task to be completed, you can move on with other task and comeback to check whether task is completed or not. If task is finished then just get the result by calling get() method, but remember its a blocking call, so it will block if task is not finished. * Java. You can use FutureTask for asynchronous processing. When you run this program, you will see that first 4 lines will be printed immediately because submit() is a non blocking method, it just takes a task and returns a Future object, it doesn't wait until task is completed. That's why you see that all three tasks to calculate factorials are submitted immediately, but they are not done yet. When our code calls get() on first Future object its blocked until the calculation is done, that's why you will see the fifth line printing after sometime. For next two lines also same story because when you call get() method it will block until result is available. BTW, you don't need to block, you can even use isDone() method to check if calculation is completed or not before calling get method. 1) Callable is a SAM type interface, so it can be used in lambda expression. 2) Callable has just one method call() which holds all the code needs to executed asynchronously. 3) In Runnable interface, there was no way to return the result of computation or throw checked exception but with Callable you can both return a value and can throw checked exception. 4) You can use get() method of Future to retrieve result once computation is done. You can check if computation is finished or not by using isDone() method. 5) You can cancel the computation by using Future.cancel() method. 6) get() is a blocking call and it blocks until computation is completed. 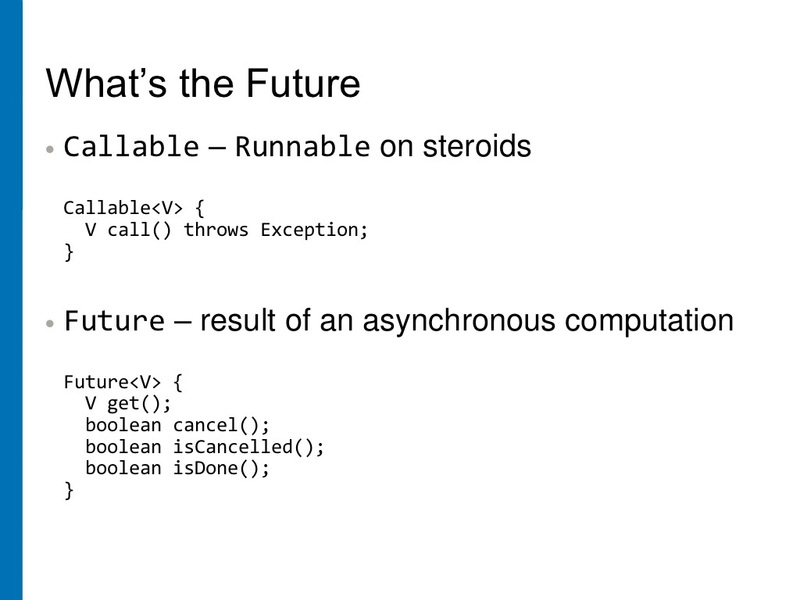 That's all about how to use Callable and Future object in Java. You can wrap asynchronous computation inside call() method and pass it to a single thread or thread pool for execution. you don't need to wait until execution complete, your thread can carry on with future object returned by call method. Once computation is done you can query the future object and get the result back. Future result10 = es.submit..... and so on.